Hola! Hoy comienza un nuevo mes y tenemos nuevo reto en Fiebre de Scrapbook por la Noche, el cual tiene un tema muy fácil: cumpleaños! Hello! 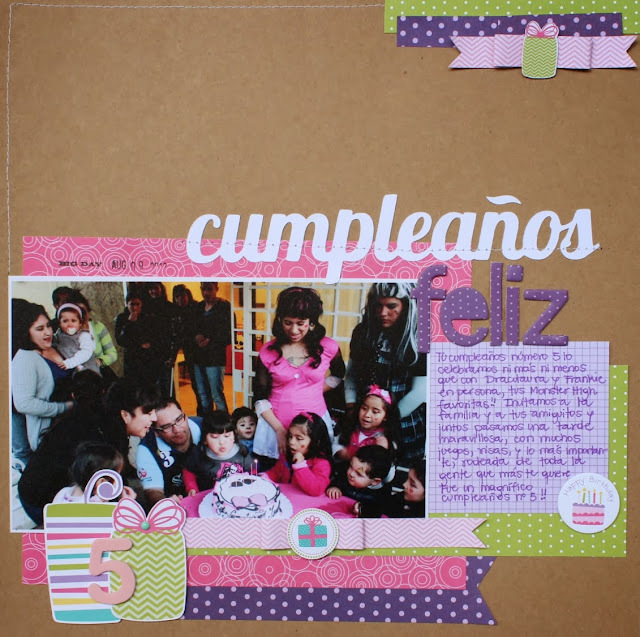 Today starts a new month and we have a new challenge at Fiebre de Scrapbook por la Noche with a easy and fun topic: birthday! 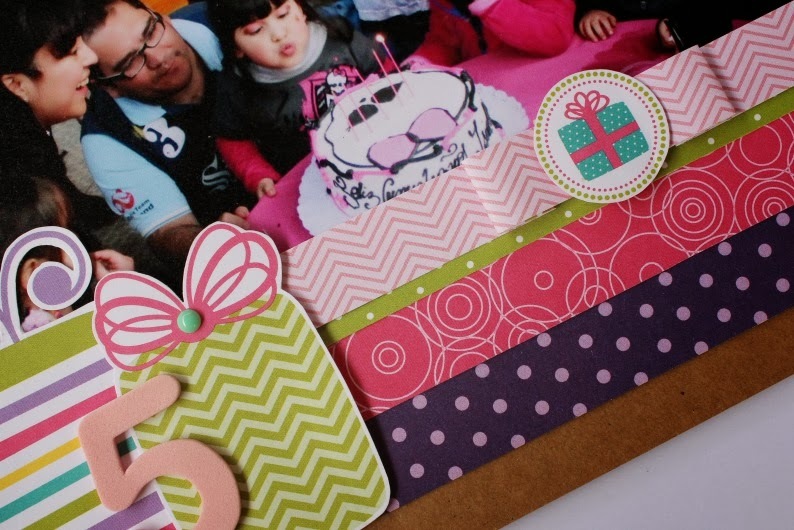 I made this layout with pics from the last birthday party of my little girl when she turned 5 few months ago. The party theme was Monster High and we were lucky enough to have Draculaura and Frankie themselves attending to her party, can you believe it?? The pic is from the moment whenall the family and friends, and of course the famous monster girls, sang happy birthday to my little Isidora. El requisito de este reto es usar tres de las 9 opciones que les presentamos en un tablero, por lo que hay muchas posibilidades para elegir. 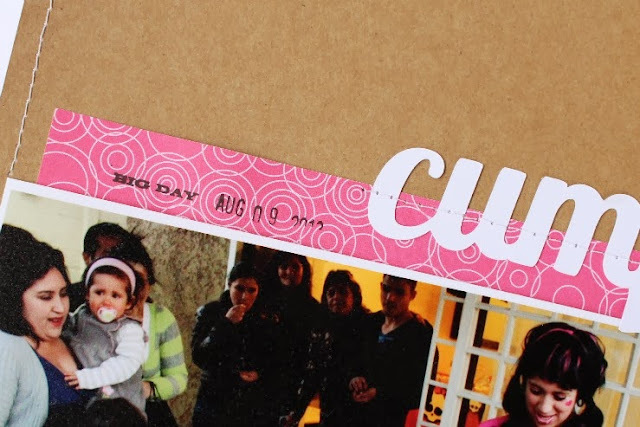 En mi caso usé "Chipboard + Journaling + Timbres". The twist of the challenge is to use 3 of the 9 options provided by a tic-tac-toe, so you have a lot of different options. In my case I chose "Chipboard + Journaling + Stamps". De entre todas las participantes elegiremos una ganadora, la que se llevará un bonito premio consistente en papeles y adornos, todo cortesía del equipo creativo de FSN. We will choose a lucky winner from all the participants, who will get a cute prize, courtesy of FSN DT. El plazo para linkear sus proyectos en esta ocasión vence el día jueves 28 de noviembre a las 12 de la noche. El proyecto ganador y los proyectos destacados se anunciarán el viernes 29 este mes. Las esperamos!! You can link your projects until November 28th at 00:00, and the winner will be annopunced on november 29th. 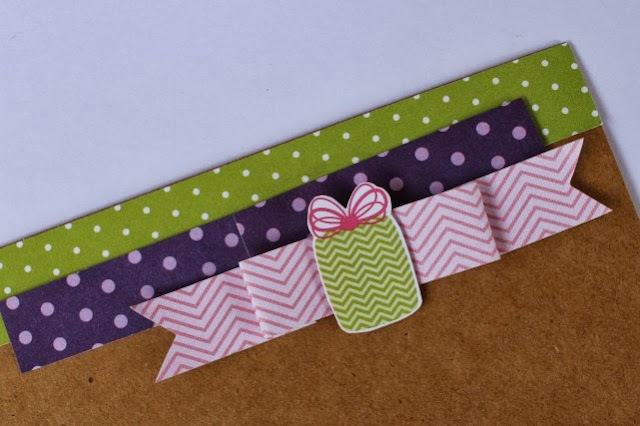 Can´t wait to see what you make with this challenge, good luck!